Background: Both ovarian/breast cancers are the most prevalent hormone-associated gynecological-cancers, where uncontrolled cellular proliferations/genetic-errors are noticed. The cancer-antigen125 (CA125), which we assessed presently is an important biomarker in the early detection/monitoring of this disease-pathogenesis. Methods: Serum/tissue CA125 was measured by solid-phase-Enzyme-linked-immunosorbentassay in women with ovarian/breast tumors of different types (epithelial/non-epithelial; benign/ borderline/ malignant)/stages. Breast-tumor tissues were employed for histoarchitecture/DNAstability (comet) assay. Extensive protein-protein(CA125) interactions were studied by the STRING (Search-Tool-for-the-Retrieval-of-Interacting Genes/Proteins) Bioinformatics-software. Results: Serum CA125 levels were <35 U/ml in 94% of benign epithelial-cases, 35-65 U/ml in 100% of borderline-tumors and >100 U/ml in the 41.17% of patients with malignant-tumors. The malignant epithelial tumor showed significantly higher (>100U/ml) CA125 than the non-epithelial malignant-tumor (<35-65 U/ml). 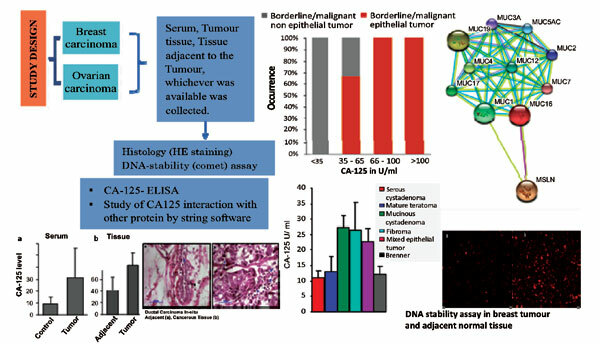 Highly enhanced cellularity/histo-architectural impairment/unstable- DNA-materials/CA125 was found in advanced breast-cancers. The CA125 is highly metabolically interactive, especially with mesothelin impairing cell-cell adhesion and enhancing tissue anti-establishment. Conclusion: CA125 is a predictive-marker in ovarian/breast carcinoma depending on disease nature/stages. CA125, in combination with other tests like mesothelin/estradiol can be of great use in the better diagnosis of this disease. Not only as a detection-marker, has the CA125 played an interactive role in the disease processes. The Bioinformatics study revealed an important role of mesothelin and other mucin like proteins. Early detection and proper diagnosis are important determinants for the greater possibility of the relief from the disease like cancers. Selection of suitable biomarker combinations may increase the better diagnosis of the types and severity of this disease. Our present result has an impact on these aspects. Breast and ovarian cancers, CA 125, cancer biomarker, estradiol, mesothelin, malignant epithelial tumor.